Our company manufacture specialized machines to perform the function of die cutting, creasing, and embossing. 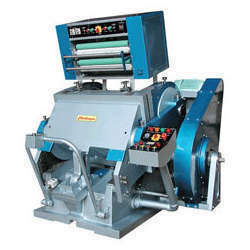 The precision engineered designs enable the machines to perform heavy jobs. Like cutting, creasing and embossing of paper, linoleum, cardboard, plastic and PVC materials. Further electromagnetic clutch and brakes are also provided for the control and adjustment of machines. Equipped with Electromagnetic Clutch & Brake system which can be adjusted as required. For sizes 32"x42" or above two set of helical gears are provided. Built-in Star Delta starter for motors 7.5 H.P or above. Variable dwell timing device (0-6 seconds) for fine & quality jobs. 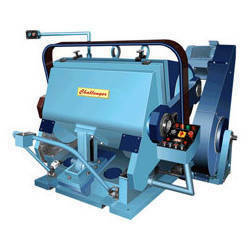 We also manufacture die cutting machine with a hot metal foil attachment. It is specially designed to provide enhanced cutting, creasing and embossing of materials. The hot foil attachment is available in single, double and triple steps. The machine is equipped with electric heating and temperature control devices, for the control of each step being performed. Further separate time controllers are provided for each step. With these functions our precision engineered machines deliver optimum results as per the the clients need. 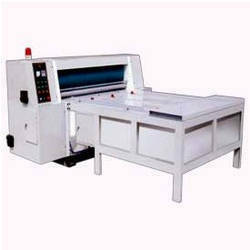 Looking for Die Cutting Creasing and Embossing Machine ?